What will he do or not do. He will be there four years or more and never give a Press Conference. All we are going to get is years of tweets. Just see if he can sneak one through. He just won’t do it. Yes, the bedrock of a Democracy is to do that. Putin is the real winner. He’s one smart man. Trump’s already got three Generals in his Cabinet. It’s the most extreme Government we will have ever had. "So much for the Shining City on the Hill". Yesterday, in talking about the election, Vice President Joe Biden actually said that. Four Black Conductors gather in the empty dining car. The Supreme Court Justices. That’s the most important. We lost that. Lost that for a longtime. First it is a whisper that becomes a shout. One is the boss. Later, alone in her chair she catalogs the passengers. Do you want to know what is happening in New York, in fact, all over the country? The Process will take its course. How can anyone take this guy seriously? I think something is going to happen. It’s got to happen. Yes I am active in the Union. I’m the head of it. If it weren’t for the Union, I would be changing diapers, cleaning houses, all that. My baby went to college. Did you see Birmingham just now? Lot of negative history. Still won’t go there. You be careful in New Orleans. Some difficult people down there. Getting ready for the new official expression of one uncontained bigotry upon another. The singular two story orange-brown brick chimney standing there without a house. The country? Travel. Uncalled for or not, the guides keep appearing. Present one moment. A ghost,the next. Nine burned to death and many more unaccounted; Oakland party warehouse fire. Horrific ending for so many so young, and the horrific realization of their fate by those who were witness, their friends, loved ones and now we "the public" saturated with the news. It is one more devastation to absorb after Trump's election. When I first read the headline, I immediately thought many must have been drawn to the warehouse to dance, holler and shake their bodies to the max to break free from the hex, the fix and aftermath of the Election. The situation is true of many of us, but how is anybody in their twenties going to face possibly eight years of a new life threatening regime. Dance, so at least you don't gag. But then this devastation. I am beyond more words. It's as If this man Trump intends to turn the globe into one huge flaming warehouse. I go out to a grassy meadow and draw my heart out. A gorgeous warm “global warming” day in the country’s capital! Lafayette, the street at the front of the White House is permanently closed to public traffic. It is open to pedestrians. About every twenty feet I am in the presence of Security on foot, or bike, or one police car or two. Each man and woman wears armor under their uniforms. Their torsos look about two feet thick. Ones in black are identified as Secret Service. The ones in green are something else. I don’t want to keep track! Green, Black and Gray, some stand at attention, they gaze back and forth across the individual and small groups that walk back and forth to the fence to take a closer look at the White House entrance. Security on bicycles circles back and forth across the street. Somehow being here is like being in the middle of a very active if not deadly virus. I am approached by a young man who wants to know if I will talk into a camera about the “minimum wage”. I say I am all for it, but I refuse to be on camera. This is not an environment to entrust anybody with the use of your image. I go to the street behind the South Lawn. I see well-dressed men and women exiting the Executive Building. One group I hear is talking about “the Judges.” Others are quiet. It is difficult to escape the sense that they are anxious about what is to happen tomorrow. 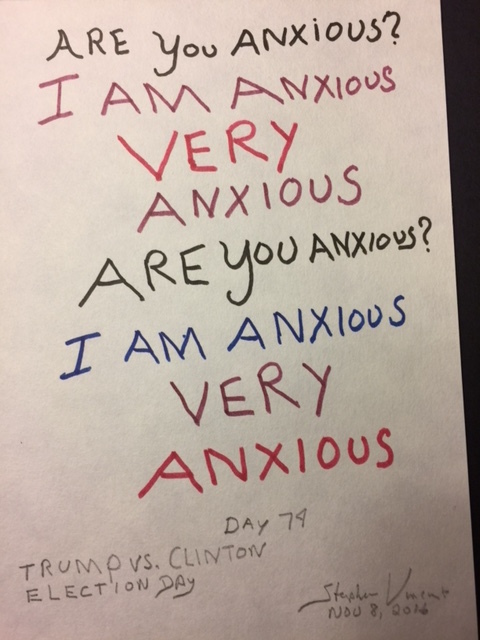 In fact everyone I talk to is anxious, the fear of a Trump victory is that pernicious. Pens in hand I am anxious about the arrival of Security. I draw for almost two hours. As it gets dark, two Secret Service guys on bikes come to check me out. “I see you are taking notes.” I left my notebook open. I tell him I am an artist and a writer and this is my work. He asks a series of template questions about how I got here from where and where I will be going. I guess I convinced them that I mean no harm. I will spare anyone the rest of details. As they leave, they also will not respond to my question of whether or not they will miss their boss. The job apparently does not permit anyone to say anything personal about the President. I would say the “public heart” is full of holes. I wrote that in my notebook. We write so gently over the long, now dead. What constitutes the interior life of a nation? Its collective particulars, its grid of shapes and flow of dissolutions? What and where are the fires that feed the shapes that appear before our eye and ears? Equally important, what are the origins and characteristics of those repressive forces that try with all their power to eliminate the fresh articulation of work that will redefine and transform a country’s collective life. This is a great show of mostly Mexican artists who used the tools of the new modernism to fight, educate and redefine the country’s life and future in the 20th Century. First, the exploitive power of new industries the institutional and politically repressive presence of the Church had to be confronted. The artist radicals – many of their names now so familiar - made use of an arsenal that included radical European models of socialist and communist organization, radical aesthetics – political murals and the proliferation of satirical woodblock cartoons - as well as radical approaches to teaching art in the schools. Different from European models, Mexican artists explored the use of Aztec and Mayan architecture and myth to imaginatively integrate the past into the present. Euro-Surrealism also became a tool in the mix. The result I would describe as a towering inferno producing new shapes, visions et al including dead ends and failures. Whatever were the outcomes, the show is a dramatic testimony of artists and poets who revolutionized their communities to seize the levers of looking and shaping the history of both Mexico and its international position in the larger world. Many will say the larger vision failed. I am sure I am not alone to count this show a most powerful success. Among I want to bet the show will challenge today’s gallery models as socially and politically useless.